“Claimed.” Last week was good, but this week was exciting and it did something I didn’t think was ever going to happen – it introduced something new about the zombie apocalypse. I thought we were done with science after the CDC was destroyed back in the first season, but low and behold they brought it back. I’m really excited that they have introduced this new element, along with some new characters – characters viewers will want to see more of, some of whom we hope the established cast can keep away from. At the end of last week’s episode Glenn (Steven Yeun) and Tara (Alanna Masterson) seemed to have been captured by a rough looking bunch in military vehicles. This week we find they haven’t been captured, but instead rescued by a trio of people trying to get to Washington D.C. One member of the group is Dr. Eugene Porter (Josh McDermitt), a scientist who believes he holds the key to solving this whole thing and can basically save the world. His companions, Sgt. 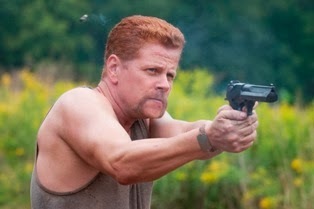 Abraham Ford (Michael Cudlitz) and Rosita Espinoza (Christian Serratos), are there to make sure Eugene makes it. Of course Glenn doesn’t really care about any of this. He just wants to find Maggie (Lauren Cohan) and stupidly risks everything – kind of like she did last week – to look for her. Given this new information I don’t care all that much about Maggie, but we are not about to just head to Washington and leave everything else behind. In this world, things are not easy and Glenn’s new companions get derailed pretty quickly. It turns out Eugene might be smart about science but his survival skills are severely lacking. That entire team ends up heading back in the direction where they found Glenn and Tara instead of toward Washington. I like these new characters. Abraham is ambiguous – part helpful and part scary – so he could interject a lot of much-needed tension between the characters. This has been lacking since we’ve lost Shane (Jon Bernthal) and Merle (Michael Rooker). Eugene is a bumbling scientist type and added some comic relief to the proceedings. Rosita didn’t get a lot to do. She is nice, but she is also Abraham’s girlfriend which means her motivations might get divided. 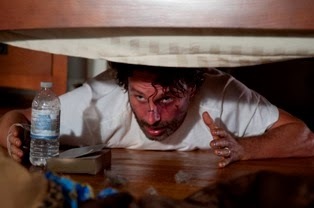 In the meantime, Rick (Andrew Lincoln) is still recovering at the house he, Carl (Chandler Riggs), and Michonne (Danai Gurira) have holed up in. 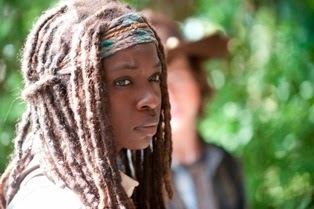 While he sleeps, Carl and Michonne head out into the neighborhood to look for food and supplies. Here is where the horror aspect of the show comes in. Rick awakens to some loud noises. Is it walkers? No it’s humans – and they don’t seem friendly. I won’t go into the details, but this was one of the most intense sequences on the show in a long time. Michonne and Carl also run into some unnerving things in the house they are searching, namely one disturbingly gruesome painting (hidden among a bunch of pleasant ones hanging on the wall) and the fate of the former inhabitants of the house. What’s exciting and unpredictable is that we are seeing more of what’s going on in the post-apocalyptic world. We learn from Glenn’s new companions that some sort of government or military body still exists (or existed) in Washington D.C. and we learn that there are still quite a few survivors around. That means there is something worth fighting for other than mere survival. We still haven’t learned any more about Terminus, but Rick, Carl and Michonne encountered the mysterious sign and decided to make it their destination, so I’m assuming we will be getting to that soon.